Miniaturization of collagen static tension tissue mold wells can potentially reduce the cost of heart valve tissue culture by lowering reagent usage and cell culture time. Four new well designs with total volumes of 1.34 mL, 0.864 mL, 0.687 mL and 0.202 mL were tested experimentally and statistically compared to the current well design in use, which has a total volume of 2.13 mL. Cardiac aortic valve cells seeded at 1x106 cells/mL and decorin-knocked out fibroblasts seeded at 2x106 cells/mL were used to determine threshold levels in collagen static tension tissue molds where scaffold contraction occurs to a significant and measurable degree without being so forceful that the tissues tear from their anchorage points. After 1.5 weeks of testing, the contraction percentage data in the cardiac aortic cell collagen static tension tissue molds showed similar contraction percentage trends in two out of the four new miniaturized wells when compared with the control while the decorin-knocked out fibroblasts collagen static tension tissue molds showed good correlation in contraction percentage for three out of the four new wells when compared with the control. Statistical analysis shows two new well designs with final volumes of 1.34 mL and 0.864 mL serve as functional alternatives to the currently used wells in collagen static tension tissue molds within the density range of 1 to 2 x106 seed cells/mL for normally contracting cardiac aortic valve cells and strongly contracting decorin-knocked out fibroblasts cells. These two new well designs reduce cost to 63% and 41% of the original value, respectively. This study has developed a new miniaturized well design that maintains the same testing integrity, offers comparable flexibility in the usage of different cell types and lowers costs. Tissue engineering holds the promise to provide better treatment options for patients suffering from heart valve disease (Vesely 2005). Current prosthetic valves either corrode or force patients to take blood thinners indefinitely (Rahimtoola 2003). Before the goal of tissue engineered heart valves can be realized the structure-function-environment relationship of cardiac valves must be characterized thoroughly (Ferdous 2005). One way to deduce details about this complex relationship is through the use of static tension tissue molds that accurately reflect in vivo tissues under uniaxial tension (Ferdous 2005). For these molds, researchers must choose a suitable scaffold; collagen is a typical choice since it is the most abundant protein in the extracellular matrix and functions in both cell organization and cell adhesion (Shi et al. 2006). 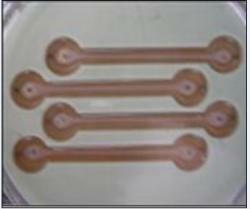 Collagen static tension tissue (CSTT) molds can be used in a myriad of ways in tissue engineering research. See Figure 1 for an example. However, current wells used in CSTT molds are prohibitively large and require a prolonged tissue contraction period. CSTT molds have been used in previous studies (Shi et al. 2006). As of now, no work has been published detailing the miniaturization of static tension tissue molds. However, there have been studies that show micro-wells help cells aggregate with each other (Khademhosseini et al. 2006). Aggregation aids increased cellular organization. A miniaturized well design would streamline experimentation and decrease cost. This study proposes and tests 4 new miniaturized well designs which maximize surface area of porous polyurethane foam holders through the integration of surface wells. This improvement in cell adherence is employed to scale down the total volume of each CSTT well. In the Grande-Allen lab, current CSTT molds are used with a variety of cell types seeded at densities ranging from 1 to 2x106 cells/ml. The contraction of collagen by various cell types is indicative of the degree of cellular organization. An additional goal of this study beyond cost reduction is to implement new mold designs with similar experimental flexibility. Each new miniaturized well design and the original well, which will serve as a control, will be tested with cardiac aortic valve cells and decorin knocked out cells,cardiac aortic cells contract to a lesser degree than strongly contracting Dcn-/- cells (Ferdous 2005). The two types of cells with different inherent contraction abilities and seeding densities (1x106/mL for the cardiac aortic valve cells and 2x106 cells/mL for the Dcn-/- mouse fibroblasts) will establish a lower and upper bound in which contraction occurs to a significant and measurable degree without being too forceful that the tissues tear from their anchorage points. Anova II statistical analysis was performed to test the variance among final contraction percentages in relation to well design. Table 1. Well I, Well II, Well III and Well IV produce 37%, 60%, 68% and 91% reductions in total volume, respectively, when compared to the Control Well. The radii, width, depth and length calculations were determined via Equation 1 for Wells I, II and IV. Equation 2 was used to determine the dimensions for Well III. The same aspect ratio of 8-1 is preserved for all new designs. A well is defined by the dog bone shaped structure as a whole. The current CSTT wells measure 40 mm long, 5 mm deep and 5 mm wide with two equally sized circles with 6 mm radii at the ends. The polyurethane holders were cut into 27 mm3 cubes with a total surface area (SA) of 54 mm2 available for cell adhesion. The holders are placed at the center of each circle in the dog bone structure. Each new miniaturized well design optimized the surface area of the holders while preserving the original geometric shape and 8-1 aspect ratio. The exact specifications of each new well, including the original, were produced in SolidWorks 2006 (educational version; Concord, MA) and sculpted using stereolithography (Laser Reproductions, Gahanna, OH) into a resin negative (Figure 2). Instead of bulky 3 mm steel pins, the anchorage points were attached to Austerlitz's 0.1 mm humidity resistant insect pins (Gardens Are, Marlborough, MA). Well Fabrication and Dimensioning Well I: A dermal punch was used to create the initial polyurethane holder. Afterwards, calipers were used to mark the depth and spacing of each well. Afterwards, a fine point needle was used to make 0.33 mm deep wells in Well I spaced equidistant from each other along all six faces. This modification increases the total SA of the holders to approximately 100 mm2 and decreases the volume of the holders to 16.9 mm3. Using equation 1, the volume of Well I was set to 1.34 mL. Table 2. It took five days before measurable contraction was seen. Well I, Well II and the Control Well produced comparable contraction percentages for the cardiac aortic cells. The greatest increases in contraction occurred within the first few days of testing. Contraction leveled off to around 50% as time progressed. Well III disconnected while Well IV failed to contract. Table 3. Measurable contraction occurred more quickly (2 days vs. 5 days) in the decorin knocked out cells. Well I, Well II, Well III created greater contraction percentages than the Control Well for decorin knocked out cells. The newly designed wells contracted approximately 10% more than the contraction in the original well. Again, we see a trend of high initial contraction followed by a leveling off to 60-70%. Well IV failed to contract. Well II: Instead of relating holder volume to total well volume, the design of Well II related the surface area of the holders to total well volume. The same procedure of holder fabrication used in Well I was employed for Well II. Using equation 2, a new well volume of 0.864 mL was determined. In addition, the radii of the circles were increased in Well II to further enhance cell adherence to the 3.4 mm deep holders. Well III and Well IV: The holder for Well III started from an approximate 2 mm x 2 mm x 2 mm cube while the holder for Well IV started from an approximate 1 mm x 1 mm x 1 mm cube. After the same modifications performed on Wells I and II were performed on Wells III and IV, respectively, new total volumes were calculated using equation 1 for Well III and IV. Table 1 summarizes the final dimensions of the current and newly designed wells. Modification of the holders became increasingly difficult as they became smaller. This precluded an exact reproduction of the calculated holder surface areas. Wells I-IV exhibit incremental decreases in volume as compared to the original well. Tissue Culture: Adult mouse cardiac aortic cells were cultured in 1 g/L glucose Dulbecco's Modified Eagle Medium (DMEM) (Mediatech, Inc., Herndon, VA), 10% Bovine Growth Serum (Hyclone, Logan, UT), 1% antibiotic (Mediatech, Inc.) and 5% Hepes buffer. They were placed in T-225 flasks in an incubator operating at 37&deg;C, 5% CO2 and 100% humidity. The media was changed every other day and after seven days of culture, cell confluence was reached. Decorin-knocked out (Dcn-/-) fibroblasts were cultured in 10 g/L glucose Dulbecco's Modified Eagle Medium (DMEM) (Mediatech, Inc.), 10% Fetal Bovine Serum (Hyclone, Logan, UT), 1% antibiotic/antimycotic/antifungal solution (Mediatech, Inc.), and 1% L-glutamine (Mediatech, Inc.). After three days under the same incubator setting and conditions as the cardiac aortic cells, cell confluence was reached. Figure 1. The original resin prototype made by SLA is not shown. A silicon mold is poured over the resin to produce the mold shown. Well I, Well II, Well III and Well IV produce 37%, 60%, 68% and 91% reductions in total volume, respectively, when compared to the Control Well. The dimensions for Well I, III and IV were calculated using Equation 1. The dimensions for Well II were calculated from Equation 2. The original well is included in this silicon mold to serve as control. Figure 2. Current CSTT mold being used in the lab with contracting heart valve tissue. The well designs are prohibitively large and require a large amount of reagents. A new cost efficient design will enhance the utility of CSTT molds in research. Collagen Gel Preparation: Collagen gel was prepared the same way for each type of CSTT mold. Cardiac aortic cells at a concentration of 1x106 cells/mL were mixed in with acid-soluble type I collagen (BD Biosciences, Franklin Lakes, NJ) at a concentration of 2 mg/mL. The Dcn-/- cells at a concentration of 2x106 cells/mL were mixed with the same type of collagen at the equivalent 2 mg/mL concentration. The two gels were poured into the CSTT molds and after two hours the collagen-cell mixture solidified. Both CSTT molds were cultured for about 1.5 weeks. The DMEM medium was changed every other day. Gel Contraction Measurement: Each CSTT mold was digitally photographed every 24 hours for the 1.5 week span where contraction occurs most (4). The diameter measurements of the gels were calculated using Image-Pro Express (Media Cybernetics, San Diego, CA). The contraction of the gel was compared to the original diameter specific to each well design to calculate a contraction percentage. Statistical Analysis: Statistical analysis was performed with Anova II to test the variance among final contraction percentages and the overall significance of the well design itself. Figure 3. Contraction percentages are shown here for all wells tested with cardiac aortic cells. There is a decreasing rate of contraction with time. The Control Well, Well I, Well II and Well III show similar trends. There is a trend of rapid contraction followed by a leveling off in every well except Well IV. Well III disconnected from the holder at day 9 while Well IV failed to contract. The tissue remained adhered to the side of the well. The final contraction percentages hovered around 51% for all successful wells. Figure 4. Contraction percentages are shown here for all wells tested with decorin knocked out cells. There is a decreasing rate of contraction with time. The Control Well, Well I, Well II and Well III show similar trends. There is a trend of rapid contraction followed by a leveling off in every well except Well IV. Again, Well IV failed to contract. The tissue remained adhered to the sides of the well. The final contraction percentages were 60-70%. Cardiac aortic cells: The aortic valve cells seeded at 1x106 /mL began to contract in the control well and Wells I and II by day 5. Contraction is described by a percentage value determined by dividing the current width of the tissue by the original tissue. The control well reported the largest initial contraction percentage of 26.9%. Well I and II had initial contraction percentages of 20% and 13.9% respectively. Well III began to contract two days later at an initial rate of 27.0%. Well IV failed to show any contraction at all but tissue formation was seen. Failure to contract is asserted when the tissue remained adhered to the sides of the wells. After thirteen days of measurement, the control well, Well I and Well II settled to roughly the same contraction percentage of around 51%. Even though Well II had the lowest initial contraction percentage, it produced the highest final contraction percentage of 53%. Figure 3 shows the contraction percentage for the cardiac aortic CSTT mold. Note, Well III disconnected from the right anchor at Day 10 with a final contraction percentage of 34.1%. Table 2 shows the contraction percentages collected for the duration of the experiment. Figure 5. The largest increases in contraction percentage are seen in the two days following initial contraction. After approximately a week of data collection, contraction leveled off. The decorin knocked out cells produced greater contraction as expected. In both cell types, Well IV failed to contract. In addition, tissue detachment occurred in Well III as shown. A possible explanation for this is the accidental addition of a large air bubble. Dcn-/- cells: The Dcn-/- cells seeded at 2x106 cells/mL contracted a full 48 hours earlier than the cardiac aortic cells (Figure 4). At day 3, the control well and Wells I-III began to contract. With these cells, Well II reported the highest initial contraction percentage of 18.8%. Well I and the original well had contraction percentages of comparable magnitudes, 14.9% and 12.3% respectively. Well III reported a smaller contraction percentage of 5.3%. Again, Well IV failed to contract for the duration of the test but tissue formation occurred. At the end of the experiment on Day 11, final contraction percentages ranged from approximately 60%-70%. Both Well I and Well II ultimately reported the highest contraction percentage of around 69%. Analogous to the trend of contraction percentage seen in cardiac aortic cells, the original well and Wells I-III gave high initial contraction percentages before a leveling off that occurred as time went on. For the wells that did contract, the percentage of contraction was comparable in the Dcn-/- CSTT mold. The final contraction percentages of the original wells for the cardiac aortic valve cells and the Dcn-/- were between 50-70%. Table 3 shows the contraction percentages calculated for the duration of the Dcn-/ CSTT mold experiment. 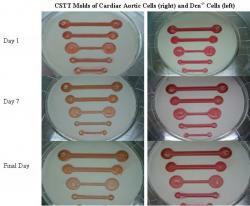 Figure 5 shows selected photographs of the cardiac aortic cells and Dcn-/- molds on day 1, day 7 and the final day. Figure 6. The new well designs substantially reduce collagen cost. Well I and Well II are effective replacements of the original well for both cell types tested, at 63% and 41% of the original cost. Well III and Well IV reduce costs further if tissue contraction is observed and tissue disconnection is avoided. Statistical analysis of experimental variance showed that well design strongly affected experimental results. In the cardiac aortic CSTT molds, the well design accounts for 24% of total variance while the well design in the Dcn-/- CSTT molds accounts for 35% of total variance. Although the data shows undoubtedly that the shape of the well has a strong influence on how cells seeded with collagen will react, further analysis revealed that the differences between final contraction percentages between the control wells and Wells I-III were statistically insignificant. With an n=1 for each cell type and seeding density, it is difficult to extrapolate further. Additional trials will hopefully support the initial findings of this study. Wells I and II have proven to be successful alternatives after experimental testing with two types of cells seeded at high and low concentrations. The fact that Wells I and II produce similar trends in contraction percentage as compared to the control indicates that these two new miniaturized designs can support a range of normal contraction cells (cardiac aortic cells) seeded at a density of 1x106/mL to high contraction cells (Dcn-/- cells) seeded at a density of 2x106/mL. Well III produced a good contraction percentage trend in the Dcn-/- mold. Although the contraction percentage data of Well III was initially promising in the cardiac aortic CSTT mold, the formed tissue disconnected at day 10 (a potential reason for this occurrence is discussed below). Oddly, the cardiac aortic cells, and not the Dcn-/- cells, produced contraction tensile forces strong enough to tear tissue from the anchorage point. At first, this result seemed contrary to the literature where the highest cell to collagen ratio gives the largest contraction (Nirmalanandhan et al. 2006, Ferdous et al. 2006, Awad et al. 2000). In addition, our experimental data contradicts an extensive report completed within the Grande-Allen lab that indicates Dcn-/- cells contract more strongly due to extensive biglycan upregulation (Ferdous 2005). The anomaly seen in Well III pointed more towards the formation of several large air bubbles than observation of a new phenomenon. When preparing the collagen gel and cell mixture for the entire CSTT mold extreme care was taken to avoid the formation of air bubbles. However, in the process of adding the collagen gel to Wells III and IV, a pipette with a capacity of 500 μL had to be employed over several repetitions. In contrast, the other wells were large enough that a 5 mL pipette of collagen gel could be added continuously. Large air bubbles were avoided in Well III in the Dcn-/- CSTT mold and Well IV for both types of cells. The formation of one particularly large air bubble in the cardiac aortic CSTT mold in Well III caused detachment. The repeated application of the tissue scaffold with the pipette may have caused the formation of the air bubble. Well IV showed no measurable contraction with both types of cells. This suggests that there is an absolute minimum of cells, independent of cell density, needed to contract the collagen gel. In Well IV, it is possible that a threshold of cell number was not met in order to produce the necessary traction forces for collagen contraction (Bell et al. 1979). This hypothesis is supported by two studies where increasing cell seeding density above a threshold did not affect contraction percentage. In a report completed by Awad et al., there were no detected differences in contraction when increasing cell density from 4 to 8 x106 cells/mL (Awad et al. 2003). Another study by Nirmalanandha et al., showed that cell seeding density over a threshold value produced no remarkable changes in cell contraction (Nirmalanandhan et al. 2006). The small total volume of Well IV, 0.202 mL, could simply not have provided enough cells to produce measurable contraction. Interestingly, the time of contraction was very similar when comparing the control well with Wells I-III. The smallest design that produced contraction percentage data, Well III, actually contracted slowest. This disproves the earlier assumption that smaller wells speed contraction rates. Although Wells I, II and III had less collagen on a mass basis than the original well, there was a proportionate decrease in the number of cells working to compact that collagen. In the end, this study illustrates how a constant cell to collagen gel density produces the same rate of contraction. However, a decrease in the total number of cells needed for the miniaturized wells decreases total cell culture time. Experimental results have shown that two of the new miniaturized designs, Well I and Well II, are suitable alternatives to the original well design. Well III remains a promising candidate. The new designs utilize lower total volume and limit reagent usage. In a four well experiment using the current design, the cost for the collagen alone would equal $21.56. If the same experiment was done using Well I, Well II and Well III the cost of collagen would fall to $13.56, $8.74 and $6.95, respectively (Figure 6). Ultimately, Well I and II offer sizeable decreases in cost while still providing the same testing flexibility and integrity as the current design. This project has numerous extensions for further study. Further trials and experiments are necessary in order to validate this report. Altering cell seeding density and collagen concentrations could produce interesting results as well. Well IV may be induced to facilitate collagen contraction if cell concentrations were increased beyond a density of 2x106 cells/mL. A natural progression for this study is mechanical testing of the contracted tissues in each well. Although similar contraction percentages were observed for Wells I-III in comparison to the original well, the mechanical strength of the contracted tissues from each well has yet to be determined. It would be important to see that the tissues grown in Wells I-III have similar mechanical properties as those grown in the control well. Moving beyond altering cell density or collagen concentrations, novel geometries could be developed for CSTT molds. These new CSTT molds could be used to investigate cross linking and interactions between several pieces of tissues. Studies using a honeycomb design have already been reported (Shi et al. 2006). Vesely, I. Heart valve tissue engineering. Circ. Res. 97, 743, 2005. Rahimtoola, S.H. Choice of prosthetic heart valve for adult patients. J. Am. Coll. Cardiol. 41, 893, 2003. Ferdous, Z. "Fibrin-based tissue engineered construct to study role of decorin on collagen fibrillogenesis and tissue mechanics." Diss. Rice University, 2005. Khademhosseini, Ali, Langer, Robert, Borenstein, Jeffrey, Vacanti, J. Microscale technologies for tissue engineering and biology. PNAS. 8, 103, 2006. Shi, Y., Rittman, L., and Vesely, I. Novel geometries for tissue-engineered tendonous collagen constructs. Tissue Engineering 2006; 12(9):2601-2609. Nirmalanandhan, V., Levy, M., Huth, A., and Butler, D. Effects of cell seeding density and collagen concentration on contraction kinetics of mesenchymal stem cell-seeded collagen constructs. Tissue Engineering 2006; 12(7);1865-1872. Ferdous, Z., Peterson, S., Wei, V.M., Hook, M., and Grande-Allen, K.J. Increased cell growth and biglycan compensation in decorin deficient gels. Unpublished manuscript, Rice University, Houston, TX. 2006. Awad, H.A., Boivin, Butler, D.L., Harris, M.T., Ibrahim, R.E., Wu, Y., Young, R.G., Kadiyala, S., and Boivin, G.P. In vitro characterization of mesenchymal stem cell-seeded collagen scaffolds for tendon repair: effects of initial seeding density on contraction kinetics. J. Biomed. Mater. Res. 51, 223, 2000. Bell, E., Ivarsson, B., and Merrill, C. Production of a tissue-like structure by contraction of collagen lattices by human fibroblasts of different proliferative potential in vitro. Pro. Natl. Acad. Sci. USA 76, 1274, 1979. Awad, H.A., Boivin, G.P., Dressler, M.R., Smith, F.N., Young, R.G. and Butler, D.L. Repair of patellar tendon injuries using a cell-collagen composite. J. Orthop. Res. 21, 420 2003.